A contemporary interior design and full architecture fit out, graphic and branding strategy for Chaps & Co Barbershop and Spa at the Dubai Jumeirah Lake Towers JLT UAE. The space includes a lounge area, barber hall a massage room, manicure and pedicure spaces. 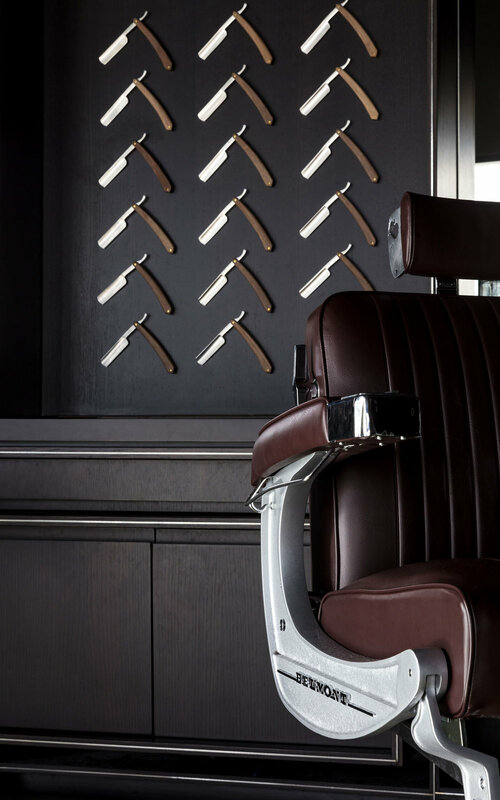 Chaps and Co Barbershop approached our practice in 2014 to design their first barbershop in Jumeirah Lake Towers in Dubai, UAE. 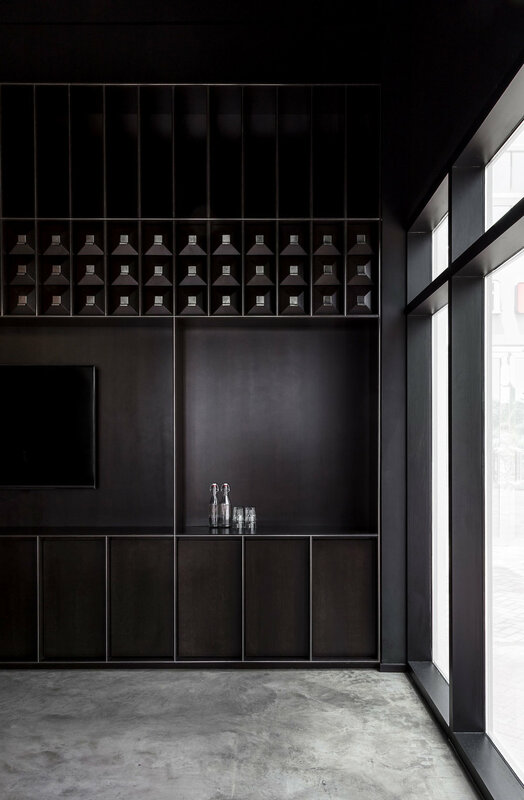 Their brief was to create a stylish and welcoming haven for the modern gentlemen that is less sterile than the alternative unisex salons offered in Dubai. As well as offering traditional barbering services, the shop offers spa treatments and a lounge area where men can relax, hang out and be served hot and cold drinks. The interior architecture at Chaps & Co, Jumeirah Lake Towers, is seen as a reflection and embellishment of the core values of the Chaps & Co brand. Inspired by the traditional English barbershop, the store is designed to embrace a contemporary aesthetic. Bespoke joinery wraps all the internal surfaces of the shop to create an immersive experience. 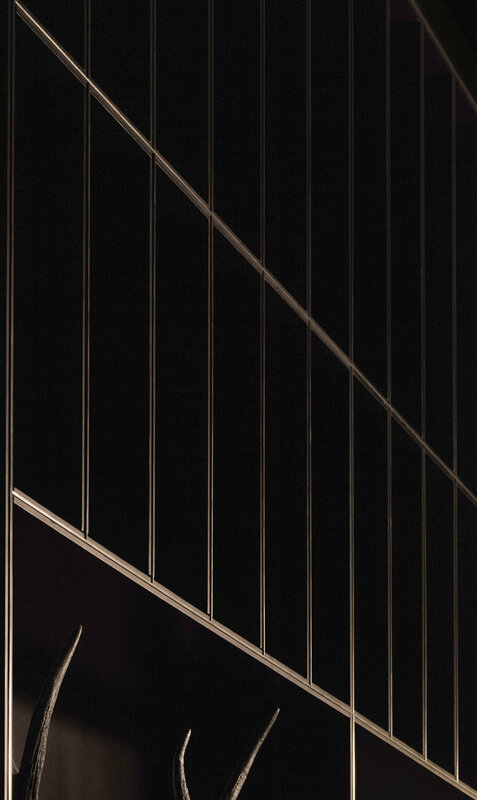 The joinery is designed to cast shadows, immersing the space with a sense of darkness and intrigue. Integral to the joinery are striking stainless steel strip details which capture light. This creates a stimulating and ephemeral atmosphere whilst reflecting the high level of craftsmanship and precision of the Chaps & Co barbers working within.